What’s your favorite meatless meal? Try this soon – it may just end up at the top of your list. In a medium size pot over medium-high heat, heat 3 tablespoons oil, then add onion and garlic. Saute for about 1-2 minutes, then add eggplant. Stir and add remaining oil, plus salt and pepper, basil and parsley. Cook for about 3-4 minutes, then add tomatoes and cook for another 2 minutes. Stir in tomato paste, marinara and wine. Cover, lower heat and simmer for about 15-20 minutes. Cook polenta and plate. Add stew on top and serve. 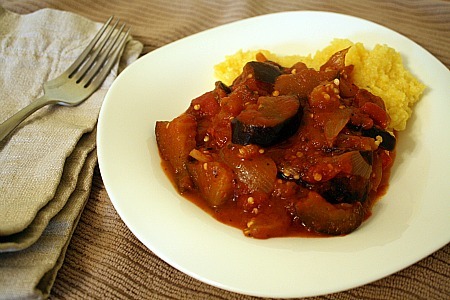 This entry was posted in eggplant, main dishes, make ahead, polenta, QuickAndEasy, tomatoes. Bookmark the permalink. Veggie stews and polenta were meant for each other, I’m pretty sure. I know I would adore this meal! It wasn’t until we were halfway through eating a veggie stew that my husband realized there was no meat in it. I wish I would have thought of polenta, though! It sounds so hearty and warming. Thanks for linking up at A Little Nosh this week!